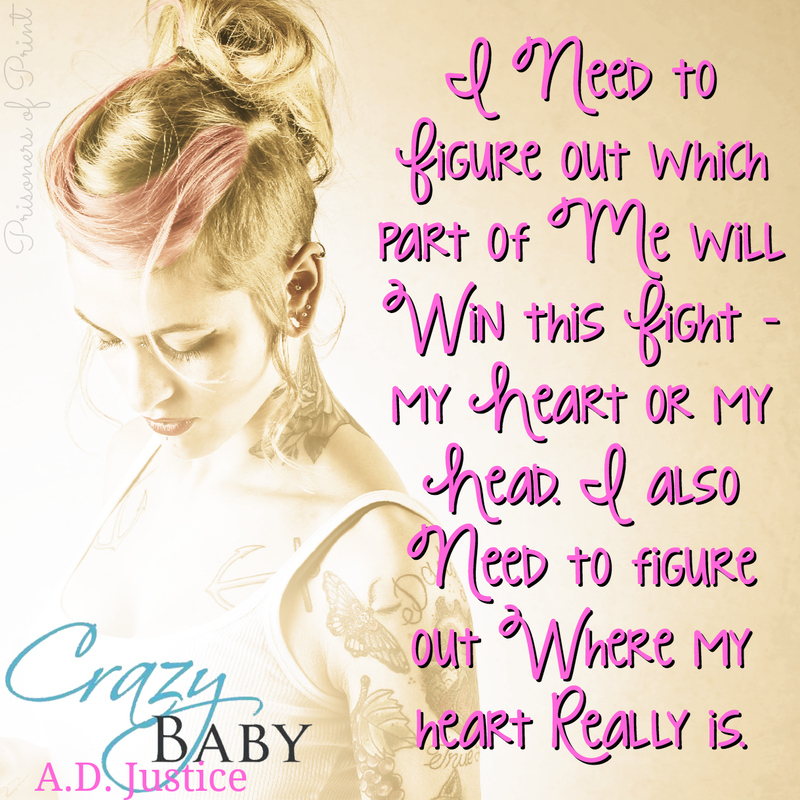 A.D. Justice continues Andi and Luke’s story in Crazy Baby. After surviving the drama of Andi’s past rearing its ugly head and dealing with the resulting emotional hurricane, these two are ready to just enjoy being together. However, they’re both young and have big dreams of the spotlight that they need to follow. That means things definitely won’t be the cakewalk they’d hoped for. Andi and Luke face that defining moment where they have to decide whether their dreams for themselves are bigger than their dreams for each other and things quickly spiral out of control. Just like the first book, A.D. Justice doesn’t pull any punches. You’ll find our couple drowning in the drama right off the bat, seeing new sides to our hero and heroine along with meeting some new characters. Crazy Baby had my head spinning, trying to keep up with the unavoidable attention and gossip that comes with life in the public eye. The story made several unexpected turns that had me ready to physically harm a fictional character. A.D. Justice definitely stirred up my own emotions with her story of hard fought love. I enjoyed seeing Andi growing into her own as she chased a dream that was just for her. She gains confidence and learns to ask for what she wants resulting in a transformation that was great to see, especially given her personal history. Luke’s career takes off and while he grows as a fighter and really begins to commit to his training, he doesn’t develop as much emotionally, leading him down the same path that tripped him up before. A.D. Justice really plays up their connection in this book, allowing it to both fuel the fire between them and feed their individual fears as well. 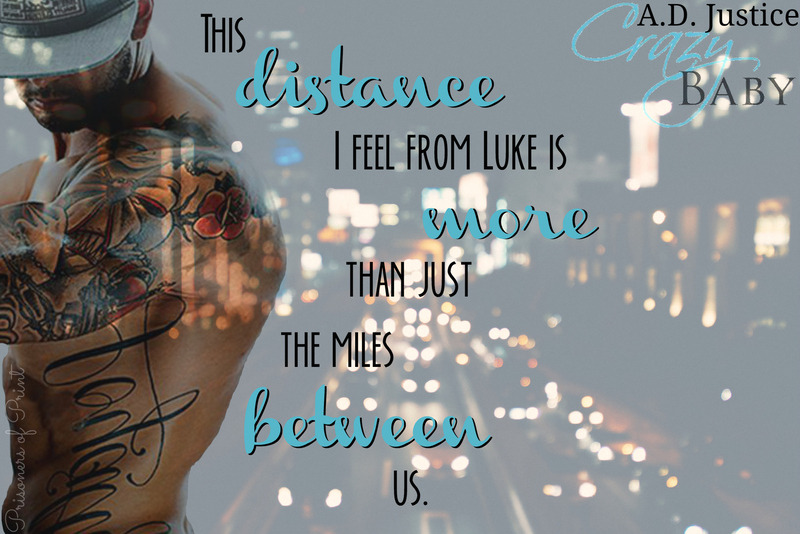 When things between Luke and Andi are good, they’re magic but when things begin to change and their relationship is tested, things fall apart quickly. The passion they share during the moments of beauty is just as evident in the instances of heartache, making sure we never forget how deep their connection really runs. Their newfound friendships reveal a lot about the fundamental nature of both Andi and Luke and I definitely felt like this gave them more substance. I hope we’ll be seeing some of the other characters again in the future. Crazy Baby is unquestionably an emotional rollercoaster. A.D. Justice took my heart and crushed it several times over just to put it back together and do it all over again. My investment in these characters guaranteed that I would experience their pain as my own, and indeed there were times when my heart absolutely ached at the disaster that was unfolding. A.D. Justice’s writing continues to evolve with each book she writes, her words becoming more polished and effortlessly consumable. I lost myself in Andi and Luke without effort, having waited impatiently for the next part of their journey. I’ll admit I found this book frustrating at times. Andi and Luke had already fought for their love once in a very big way so I’d hoped that they’d both grown significantly from the experience. It was hard to see them right back where they started, being manipulated by the media and forgetting to trust in one another. Their palpable pain helped sooth some of my own, knowing that their foundation of love remained in tact. Crazy Baby certainly delivered the Andi and Luke I’d missed since finishing Crazy Maybe, but with a new level of complicated and a lot more to lose.